The two seater Morgan 4/4 Series 5 sports car was launched immediately following the end of production of the 4/4 Series 4 in February 1963. It was powered by the Ford 116E 1498 cc, overhead valve, pushrod engine, as used in the Ford Cortina saloon, and linked to a Ford four speed gearbox. It developed 65 bhp, 86 ft/lbs of torque, had a compression ratio of 8.3:1, and used a single Stromberg 33VN carburettor. A remote gear change was offered as an optional extra. Front disc brakes and rear drums were retained as standard equipment. When production ended in March 1968, after a run of five years, only 370 units of the Series 5 were built. Introduced at the same time as the Series 5 was the two seater Series 5 Competition model. This was powered by the same Ford 1498 cc, 4-cylinder engine as used in the Ford Cortina GT saloon. Up to that time, only the 4/4 Series 2 and 5 featured both a Standard and Competition model. By March 1968, a total of 270 Series 5 Competition units had been built. 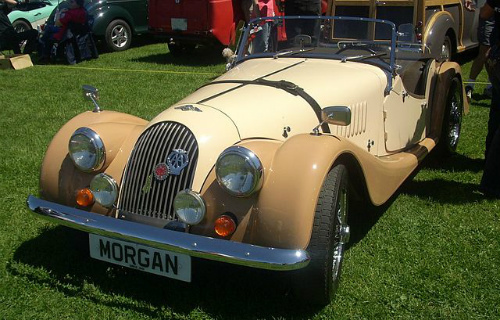 The market awaited the launch, that same month, of the Morgan 4/4 1600 and 4/4 1600 Competition models, both of which offered improved performance.